In the first Hub on part-writing we looked at the tonic and dominant chords and the usual ‘lines’ that realize the I-V-I chord progression, the concepts of chord ‘spacing’ and ‘doubling.’ In its companion, we learned about the vocal ranges for each of the four parts of the normal choral texture, and worked practice exercises to build skill in writing tonic and dominant chords. If you’re not familiar with these materials, you should read those Hubs first (and most definitely work the exercises!) The links are given below. Assuming you are OK with all that, then in this Hub we’ll be looking at how to use the subdominant chord—that is, the chord built upon scale degree 4, as shown below. And as before, we’ll do that using a short chord progression as a model, and looking at the musical ‘lines’ making up that progression. How to write the most common Classical chord progression, with audio/video examples and easy-to-understand explanations. A companion to "Part-Writing Chords: Tonic And Dominant I," this Hub consists of practical exercises to build skill in part-writing tonic and dominant chord connections. Let’s start by contrasting the subdominant chord with the dominant. We’ve seen that the tonic and dominant are the two most important chords in traditional harmony: the dominant is the most unstable, ‘yearning’ chord, while the tonic is highly stable—the goal toward which the dominant yearns. Harmony is sometimes described as being “polarized” between these two extremes. In this context, the role of the subdominant is to prepare or lead up to the dominant. 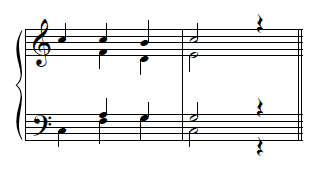 From another point of view, the subdominant is quite similar to the dominant, in that the roots of both are a fifth away from that of the tonic chord, as shown for the key of C major in Example 2 below. The root of the dominant is a fifth above that of the tonic, "C"; the subdominant’s, a fifth below. 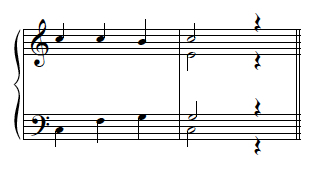 The version of I-V-I seen in Example 3 combines neighbor-note lines—the “1-7-1” and “3-2-3” lines in the lower two notes of the treble staff—with a “common-tone” line, “5-5-5,” which simply holds the one tone common to both chords. 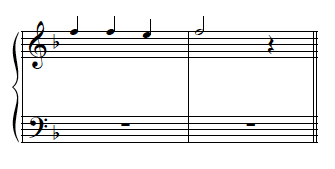 Correspondingly, the subdominant equivalent has “5-6-5” and “3-4-3” neighbor tone lines above a “1-1-1” common-tone line. Actually, the voice leading of all pairs of chords with roots related by fifth can work similarly—though as we’ll see later, the chord upon scale degree seven has some limitations that will affect this statement. So, for example, ii-vi-ii, or vi-iii-vi could use voice leading (another term roughly synonymous with ‘part-writing’) corresponding to that illustrated above. The term used for this is “root motion by fifth”—or by fourth, as it works out to be the same thing for practical purposes. In popular music, connecting the two chords just exactly as they are shown above is a pretty common thing. Not so in common-practice music. In the latter style, the voices which comprise a harmony are intended always to maintain their independence, and the harmonies are to blend smoothly and (normally!) to succeed one another smoothly. Musicians discovered early on that allowing certain types of parallel motion disrupted that goal. So, we have a new rule: in common-practice part-writing, parallel octaves, unisons and fifths are to be avoided, with very few exceptions ever allowed. This version is easily summed up: the bass moves up by step, while all other parts move downward in contrary motion. In the upper voices, that gives us a “1-7” line, a “6-5” line, and a “4-2” line—that last moving down by skip instead of step. Of course, the upper voice lines can be presented in any vertical order in realizations of this progression, and all the lines are pretty common in the soprano, including the “4-2” line. It’s much less common, perhaps because the leap of a fourth, seen above in the tenor voice--“C” down to “G”—makes it less smooth. However, it’s clearly a ‘legal’ option. Just as was true for chord progressions using root motion by fifth, any two chords with roots related by second can use the same voice-leading patterns laid out here--for example, a V-vi progression, or even the time-reversed vi-V. But as we’ll see in a later Hub, not all such progressions work as well, or are used as frequently, as IV-V.
Now let’s practice using these voice-leading patterns in different keys, using the 4-chord harmonic pattern I-IV-V-I. We’ll walk through the first one as an example. 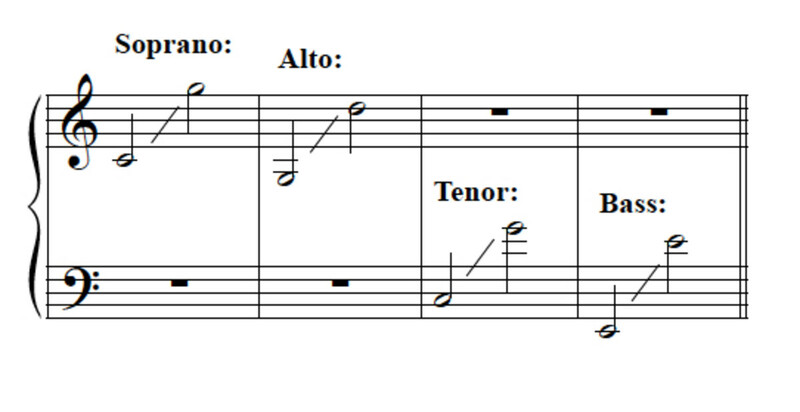 Here’s the given soprano line, to be harmonized with the pattern I-IV-V-I. As a review question, what key are we in? And what scale degrees form the soprano line? No sharps or flats makes the key C major—jokingly referred to sometimes as “the people’s key”—and the soprano line is “1-1-7-1.” Your first step should be to write the bass line corresponding to the roots of the I, IV, V and I chords. Free blank grand staff templates in portrait and landscape orientation in PDF format. Write the “F” and “G” in different octaves—the bass must approach the “G” by step, not by the awkward leap of a 7th or 9th. But how do we add the next notes? We don’t yet know the characteristic lines that we can use for this progression. 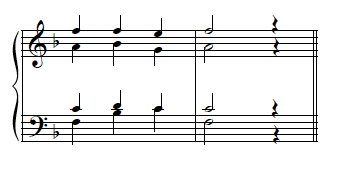 In this version, we have arbitrarily chosen to write the chord in what is called ‘open spacing.’ That means that the upper voices have potential chord tones ‘separating’ them—for instance, the alto could have had the “G” lying between the “E” and the soprano “C”, rather than the actual “E” written, since that “G” is a chord tone. With a chord to aim toward, we can now use the patterns we know for the connection of the V-I chord. Look back to Example 10, and see if you can pick the correct chord tones needed to make the V chord connect smoothly with the I. 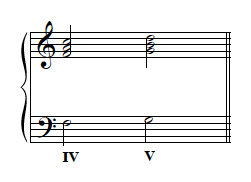 As shown, the tenor “G” is the tone common to both chords, giving us a “5-5” tenor, while the alto runs parallel to the soprano, “2-3.” Use the contrary motion pattern for IV-V, which we discussed above, to fill in the IV chord. The tenor has “6-5”, parallel to the soprano, while the alto skips downward, “4-2.” Now fill in the first chord to complete the exercise. Let’s shift our focus to the entire lines now: the alto line is “3-4-2-3” and the tenor is “5-6-5-5”; they accompany a (mostly) common-tone soprano tracing “1-1-7-1.” Let’s use these lines as the patterns for our next several exercises, which simply move the progression from key to key, and the lines from voice to voice. As in previous exercises, first identify the key. 1) For keys with flats in the key signature: the last flat to the right is always scale degree 4; to find the tonic, count down the scale to scale degree 1. Shortcut: for all keys with 2 or more flats in the signature, this will also work out to be the 2nd last flat in the key signature. 2) For sharp keys, the last sharp is always scale degree 7; to find the tonic, go up one scale step to scale degree 1. When you've got the key, identify the scale degrees of the given line. 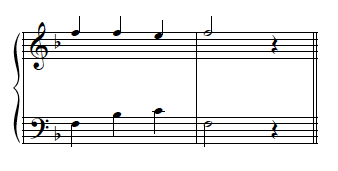 We are in the key of F, and the soprano corresponds to that of exercise—“1-1-7-1.” Add the bass line next, then the line beginning on scale degree 5. Finally, add the line beginning on scale degree 3. This harmonization is identical to that of exercise 1, and there’s not much alternative in this key—other possibilities create too much space, or else take the tenor too high. Let’s try another. As always, start by identifying key and the scale degrees of the soprano line given. D major, “3-4-2-3.” Add the bass, then alto and tenor, in that order. Once again, there’s really only one solution. Key and soprano scale degrees? Add a bass, beginning on the "Ab" at the bottom of the staff. Then add alto and tenor in that order. 1) Close position chords have upper voices which occupy adjacent chord tones—in other words, their tones are as close together as possible. 2) Open position chords have upper voices separated by an ‘unused’ chord tone—their tones are spaced farther apart. This is open spacing all the way. Let's do a couple more similar exercises for practice before we change it up slightly. Does this combination of bass and soprano change something about the spacing of your first chord? Ponder that question as you add alto and tenor parts. Yes, with the bass and soprano so close together you are forced to use close spacing--there's no room between soprano and bass to spread out the inner voices. Once again, we have a “5-6-5-5” line, this time in Eb major. Add a bass line, and include the lower “Bb” in the bass register. 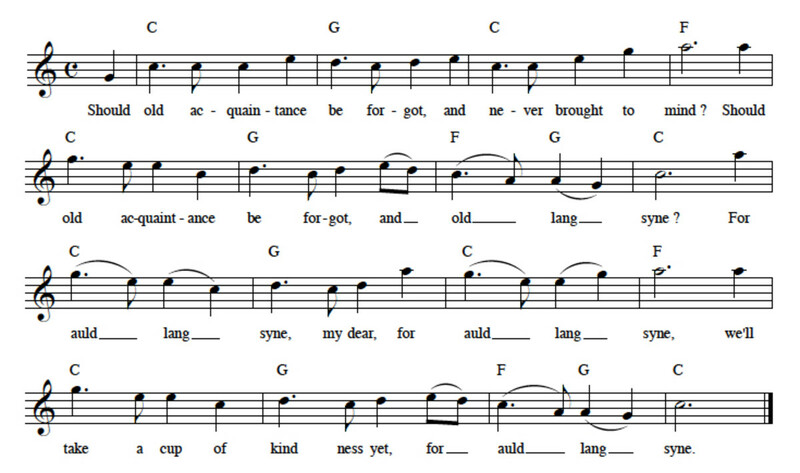 Can you use open spaced chords? If yes, do so as you add alto and tenor parts. Let’s try a different given line. What are the key and scale degrees? A good strategy for approaching the new soprano is to compare it to the lines we used previously. Clearly, “5-4-2-3” is most similar to “3-4-2-3;” only the first tone differs. So let’s look back to Example 18, which uses that line—for convenience I’ve presented it again below, transposed to our present key. Example 29--Ex. 18 transposed to A major. Using that model, complete alto and tenor. 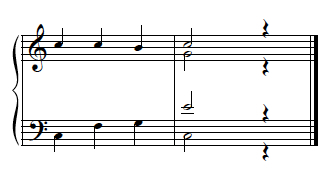 Note how the voice exchange forces the leap of a fourth in the tenor, so that it initially moves in parallel tenths with the bass. (A tenth is the same as an octave plus a third.) This also helps make the switch from the open-spaced I chord to the close-spaced IV. 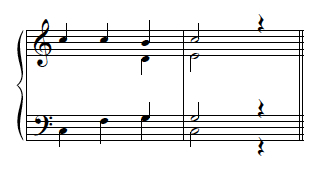 When bass and soprano to a perfect fifth in similar motion, and the soprano does not move by step—that is, when it moves a third or more—then a prohibited similar fifth has occurred. 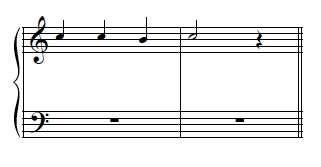 Example 31-b--Bass line creating similar fifths with soprano. 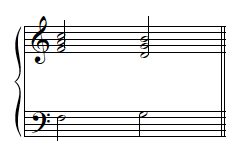 Consider the motion from the first 'chord' to the second: since the soprano and bass both move downward, but not by the same interval, they are moving by similar motion—and the soprano (which skips down a third) is moving by skip, not step. These are precisely the two conditions described above as creating an illegal similar fifth! Now add the alto part. Add the tenor. Hint: it is almost, but not quite, in correspondence with the “5-6-5-5” line we’ve used in several instances; only the first tone differs. Notice that this alto line, “5-4-2-3,” corresponds to the soprano line we just used in Exercise 7. Does the tenor line correspond to a previous line, too? In E, we have a “1-6-7-1” soprano. 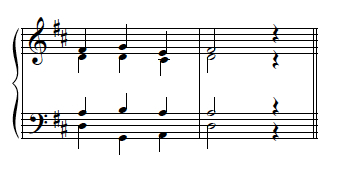 Note what’s ‘dangerous’ about this line: we can’t use the normal option of moving the upper voices contrary to the bass when connecting IV and V, since the given soprano is in parallel thirds with the bass. Parallel thirds are good, but since we know that this scenario is not quite normal, let’s proceed with caution! There are several other good options for the bass, including writing it an octave lower. 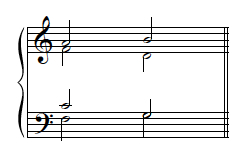 These would affect the ‘sound’ of the harmonization a bit, but shouldn’t affect the part-writing. This comes close to passing muster, although the tenor is a semi-tone above our ‘legal’ range, and also moves with a consecutive skip and leap. To eliminate these flaws, we can use another new option: that of writing an incomplete chord. So far, all our chords have been "complete"–that is, they contain all three chord member: a root, a third and a fifth. However, in common-practice style it can sometimes be advantageous to omit the fifth of a triad, leaving only root and third. (Note that the fifth is the only member of a triad which may be omitted! 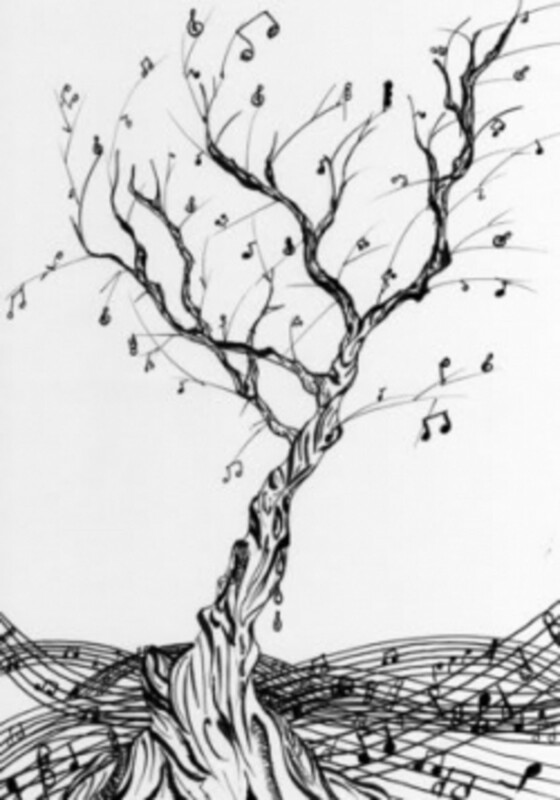 Triads must have both root and third in common-practice music.) So our doubling options include the use of incomplete triads. The alternative would be to double both root and third; this, too, happens sometimes, but less often than the triple root. Note that it never happens with the dominant chord, since the third of the dominant is the leading tone—too active a tone ever to double. Complete I chord, tenor a bit too high. Incomplete I chord (triple root), comfortable tenor and common tone kept. We have “5-6-7-1” in B major. 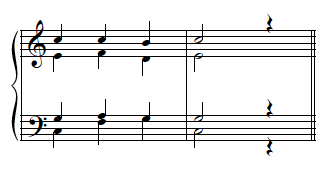 Clearly we won’t be using an incomplete tonic triad to start, since the fifth is already included in the given soprano. Does this affect the other parts? Complete them to find out. No, as it turns out. The alto and tenor correspond exactly with those used in Example 38. 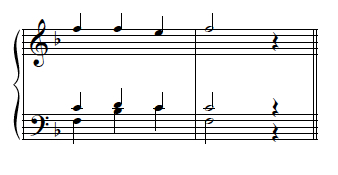 The difference is only the complete triad resulting from the fifth given in the soprano. snowonmusic | A music theory blog that's NOT all work! Ask the Doc questions, hang out, or play musical parlor games like "What Would Johann Do?" The use of incomplete triads. Once again, we’ve covered lots of ground—certainly lots for just one Hub. But stay tuned—there’s more yet to come as we continue this series! How to use inverted triads in common-practice four-part writing. Learn to write tonic, dominant and subdominant in first inversion--these explanations, illustrations, and practice examples make it easy! The first of a pair of articles on how (not) to practice music, this article sets the record straight on much confusing practice advice you hear. Plus, great pictures of some musical greats! I hope this Hub helped you understand--or even master--the standard ways to connect the IV to the I and the V. If anything is unclear, please let me know. And let me know, too, if there's a topic you'd like me to write about!